This revised Six Steps to Success programme aims to enhance end of life care through facilitating organisational change and supporting and educating staff to develop their roles around end of life care. At the core of the Six Steps Programme is the nomination of two or three representatives from the care home. Having representatives for end of life care will ensure each care home has champions who have access to current national and local information. They will be supported to develop their knowledge and skills and encouraged to empower and educate staff within their organisation to deliver end of life care. The programme can be delivered in a number of different ways to support and empower the care home representatives to implement and embed the Six Steps to Success within their care home. As with the original programme, it can be delivered within a workshop format which will comprise of six workshops, however, depending on the need of a care home, it can also be delivered to individually to match their current needs. This can be useful when care homes have already got a high level of understanding of end of life care or have previously completed the programme or have undertaken other forms of development around end of life. The programme starts with a process called ‘Stepping on‘ and will be completed by ‘Stepping off‘. A new addition to the revised programme is the Six Steps to Learning. This has been developed to ensure that all care home staff have a knowledge of end of life care, and not just the representatives. A ‘Six Steps to Learning Log’ has been devised to accompany the programme and it is expected that an agreed number of care home staff will complete these logs. Again, this learning can be provided formally, however it is recognised that this may not be realistic, so a number of flexible learning opportunities have been proposed, from existing learning resources, to bespoke resources developed for this programme. The programme will support collaborative, multi-professional working across all settings and, following successful completion of the programme, the care home representatives will be encouraged to develop and attend a local care home forum to stay at the forefront of end of life care within their locality. Care home staff will be supported by an End of Life Care Facilitator from their local area who will support the Six Steps to Success programme and provide support and education to staff. There is no charge for this programme. However, care homes need to commit to the programme by supporting their representatives to attend the full programme and to support, embed and sustain the organisational change required, which will be demonstrated in a completed portfolio of evidence. 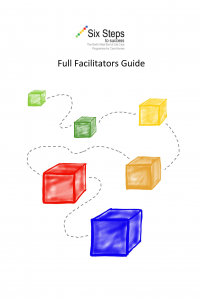 The facilitator guide contains additional information to enable facilitators to support each of the Six Steps and a more detailed programme overview. Each Step is accompanied by supporting information, documents and case studies which can be downloaded from the individual Steps.